Crowd watches during the 4:30pm feeding of the young Dane group. Feedings are shown daily on explore.org. Photo by Mark Amirault. The Service Dog Project has donated over 45 Great Danes as service dogs to individuals with severe balance and mobility limitations, including Multiple Sclerosis, PTSD and more. Preference is given to Veterans who need a better quality of life. The daily administration, cleaning, feeding, exercise & training activities of the dogs are lovingly carried out by the project’s owner, Carlene White, her small staff, and an army of volunteers, including myself. 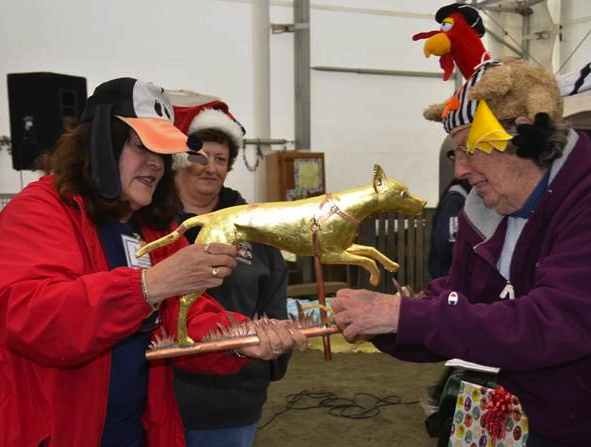 The staff and volunteers work tirelessly for the nonprofit organization, located in Ipswich, MA, and are the foundation of the SDP program. In June of 2012, explore.org, a multimedia organization that documents leaders around the world who have devoted their lives to extraordinary causes, began live online streaming of the activities at SDP through web cams located on the property. This new reality-based experience has created a seismic shift in the dynamic of the farm. Now thousands of visitors are educated through real-time viewing of the dogs which typically run 24-7. This has also opened the lines of communication with those on the farm about the ongoing activities through continuous online comments and emails. This interaction does allows for a new online fundraising resource which allows SDP to produce and donate more service dogs each year. 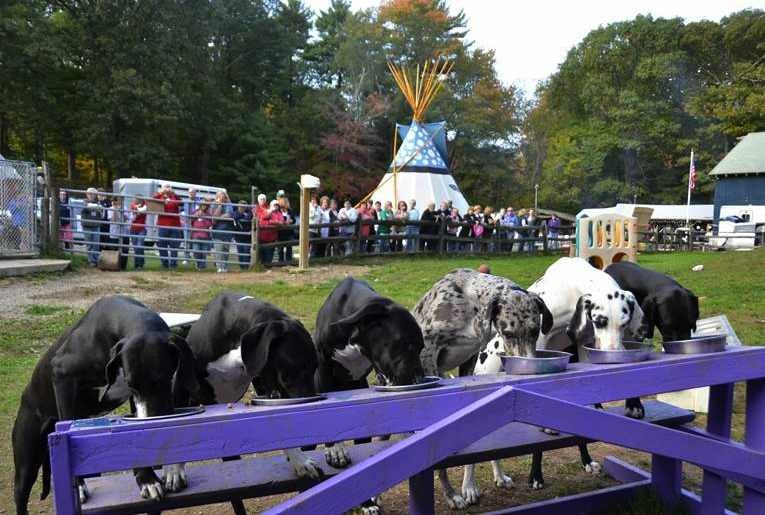 The 501c3, fully accredited by Assistance Dogs International, is a farm that raises Great Danes, has 2 horses, a donkey, chickens, a pond and a tee-pee. Yes, a tee-pee. The tee-pee is sponsored by the online community group known as “the camera people”, or “CP’s” and it has become a respite for those visiting to find peace and relaxation, or looking to spend quiet time with one of the dogs. The CP community grew from the comment sections of the indoor puppy & puppy hill web cams on explore.org. 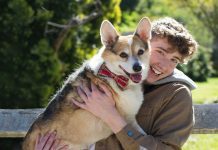 Hundreds of people asking questions, sharing experiences, chatting with one another, all watched together as each batch of puppies, with their purpose predetermined, is brought into the world. They watch as they grow, develop, train and then finally, as they leave with their new recipient. A sad day for many as they have watched the dogs carefully through the months, but ultimately a glorious outcome as they continue to watch them transform the lives of their new owners. It’s amazing really. And, the community of CP’s helps keep this life-cycle flowing by answering calls for needed resources with donations, physical visits to help when they can, and, of course, they continue to watch, while becoming a part of the history, at SDP. Carlene gifted with a Great Dane weather vane, purchased with funds raised by online community. Photo by Mark Amirault. Laughing, smiling, meeting others only known online, meeting Carlene, the volunteers and staff, playing with dogs of all sizes, were all the main focus of those at the event. Spirit sticks were created by those who could not attend and sent to SDP to be displayed. They were shown on camera so those at home could see. Squeezed in along the way was a clam bake, barn painting, laundry folding, poop scooping, crazy hat day, chicken poop bingo and Carlene’s “chicken stew.” Volunteers spent the weekend making sure the farm ran as usual while also enjoying the festivities of the retreat. Despite some rain, the weekend was overflowing with nothing but happiness and joy, and the event was a huge success. Invigorating, actually. With many CP’s later described the SDP retreat, via explore and Facebook comments, as the “happiest place on earth,” even better than “Disney” for those who had only before been able to visit virtually. Many cried when they had to leave. I volunteer weekly and can tell you first hand, the farm is a wonderful experience that always leaves you wanting more. The dogs, the staff, the volunteers and the camera people, have become an important part of each others lives- they have become family. And, it is the love for the dogs, those Great Danes, that keeps people emotionally and spiritually charged. There is something dynamic about a beautifully large, selflessly loyal, fun-loving animal, whose purpose is to care for others. It is awe-inspiring and truly motivational in nature and it is heartwarming to say the least. These dogs, unbeknownst to them, are destined not only to touch the hearts and change the lives of those they service, but of every individual they meet along the way. They have helped build a community far greater than one can imagine. New Volunteers are Always Welcome. Visit the Service Dog Project website, www.servicedogproject.org , or visit the farm during their Sunday Stew, held every Sunday from 12-4pm, for visitors to come meet the dogs, and learn about SDP. Watch the cameras on www.explore.org. If you are a Veteran with PTSD, have MS or other immobilizing challenge and live locally, please visit the farm, or the site for more information on becoming a recipient. You are all invited to become a part of the SDP community!